Timothy Lundin submitted this photo and caption. 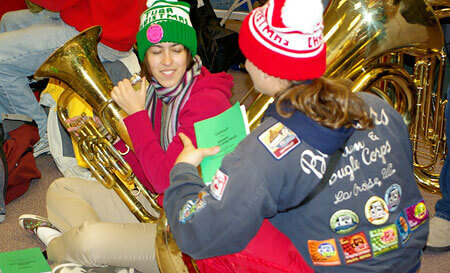 Two Blue Stars members took part this year in "Tuba Christmas." Ellie Lundin who plays trumpet for the Blue Stars and Anthony Leonhardt, a Blue Stars tuba player, joined 149 other low brass musicians in Sioux Falls, S.D. to bring Christmas cheer to Children's Care Hospital and two other venues in the city. Matt Dillon submitted this photo and caption. 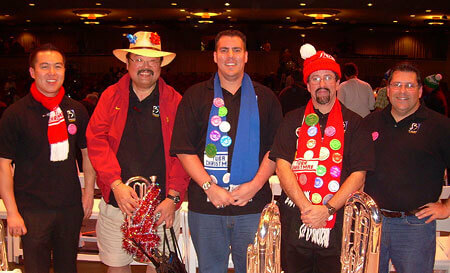 This is a photo of some Blue Devils alumni who got together for the "Tuba Christmas" event in Los Angeles on Dec. 2. Several of us met for the first time last summer when we celebrated not only the 50th anniversary of the Blue Devils organization, but the 12th World Championship title in their history! Even though we span the years from 1977 up to 1996, it's a pretty tight group. From left to right: Anthony Cheng ('91), Ronny Hirata ('77), Amado Segobia ('94-'96), Erron Garrett ('82-'84) and Matt Dillon ('84). Standing on the field with our friends from the Santa Clara Vanguard Alumni who were celebrating their 40th anniversary was an awesome experience. We hope it will provide some motivation for members of the past to get more involved in supporting these great drum and bugle corps organizations.